mAPP is right for everyone who needs offline mapping on iOS. 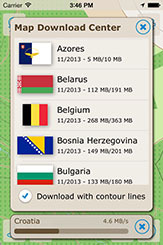 Download OSM vector maps on your device and use it in dead spots or in other countries without roaming costs. Pure offline maps in a clear surface. No bells and whistles, no social, no restaurant suggestions. Just orientation! Ideal for hobby and travel. Load whole countries or states and view them later without internet connection. 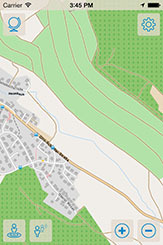 The maps includes full OSM detail down to small pathways. As well contour lines included in the topo maps. Record tracks and store them on the device or share them as a gpx file. You can also import gpx tracks provided by several platforms for hiking and cycling and display them on the map. Enter waypoints to mark a location. So you can use mAPP also for hobbies like geocaching. 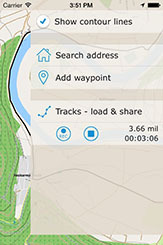 Use the link options in other apps like Looking4Cache or Geosphere to share waypoints.